The bring-your-own-device trend has brought a lot of productivity and flexibility into many Canadian organizations but it has also spawned a serious security issue for a large number of businesses, according to a report recently released by Web-security firm Websense Inc. 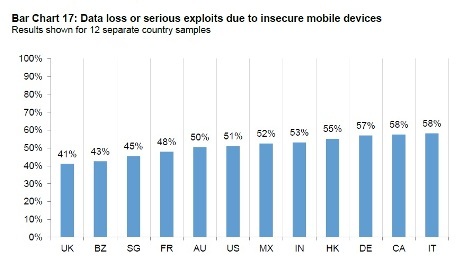 The report titled Global Study on Mobile Risk, indicated that Canada and Italy are tied for the number one spot in losing the most corporate data through employee operated mobile devices. The survey, which queried key IT security personnel from 12 countries, found that 58 per cent of Canadian and Italian respondents admitted their business lost company data through employees using un-secured mobile devices such as laptops, smartphones, tablets and USB keys. 45 per cent of respondents report that employees circumvent or disengage security features, such as passwords and key locks, on corporate and personal mobile devices. 58 per cent of the organizations in this study experienced data loss resulting from employee use of unsecured mobile devices, including laptops, smartphones, USB devices, and tablets. 71 per cent of respondents agree that the use of mobile devices in the workplace is important to achieving business objectives. A similar percentage (72 per cent) believes that these tools put their organizations at risk. Only half of the organizations have the necessary security controls to address the risk, and only six per cent say that all employees are compliant and five per cent do not know. 62 per cent of respondents say that over the past 12 months, their organizations experienced an increase in malware infections as a result of insecure mobile devices in the workplace. 26 per cent of respondents say that mobile devices are responsible for an increase of more than 50 per cent in malware infections. And, out of the 12 countries surveyed, Canada made the top three for the highest amount of infections. 65 per cent of respondents are most concerned with employees taking photos or videos in the workplace-probably due to fears about the theft or exposure of confidential information.